Quality outdoor basketballs are not an easy item to find. The problem is that they have to be durable enough to withstand the wear and tear and still soft enough so you get the best feel. Spalding struck an excellent balance with this model. This is an Official NBA size and weight ball that can be used for both amateur games and competitions. In addition to size 7, you can also get it in sizes 6 and 5, which makes it a good versatile model for all ages and genders. The price of around $70 puts this ball in the higher tier in the class. Testing this ball has proven to be quite a fun task for us and here are some of our observations. This is an outdoor basketball, which means that it was always gonna be a bit harsher on the palm, but then again, we were really pleasantly surprised by the softness of this model. The handling is consistent regardless of the surface you are playing on and even when the ball gets a bit dusty and dirty, the grip is not affected. The wet hand test did not impress us, but we also weren’t disappointed as well. The channels are symmetrical and deep enough to make sure your release and rotation during the shots are excellent. This model features amazing overall control which is rare for outside basketballs. Spalding’s Never Flat technology featured in this ball has been battle tested over and over again. The ball is injected with NitroFlate molecules that make sure it never gets deflated. This all bodes well for the bounce and the test results were quite impressive. Regardless of the temperature, surface, or the strength of the bounce, this model gave consistent results. For this type of basketball, it is important that the ball always ends up exactly where you want it, and this one does. The only issue with this model is that if you deflate it on purpose, you lose the Never Flat warranty. 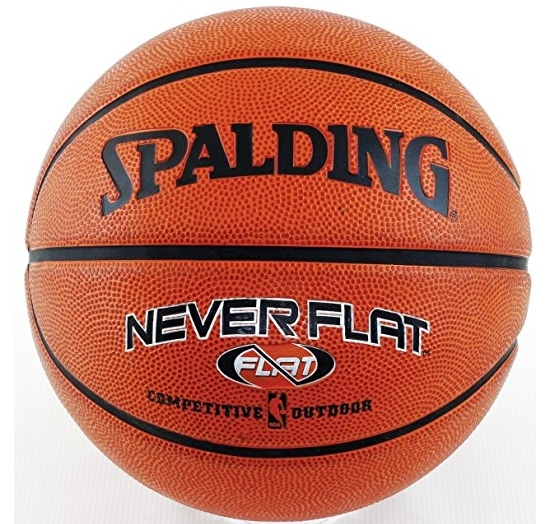 There is no doubt that this is one of the premium outdoors basketball models that Spalding is offering. The good thing is that it is quite durable, so when you think about it, the value for money is excellent since you should be able to use it for a couple of seasons. The NBA regulation size and weight makes this ball a perfect candidate for competitive games, and the price well bellow $100 also makes it affordable for amateur players. An average user rating of 3.8 stars would be a lot higher if there wasn’t for the warranty issue.